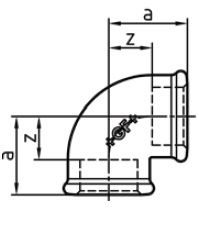 These elbows are used for the connection of equally sized male malleable iron pipe or fittings at an angle of 90°. They are shorter than bends so are used where space is limited. MLB IRN GF Elbow 90 Female Black 1/8"
MLB IRN GF Elbow 90 Female Black 1/4"
MLB IRN GF Elbow 90 Female Black 3/8"
MLB IRN GF Elbow 90 Female Black 1/2"
MLB IRN GF Elbow 90 Female Black 3/4"
MLB IRN GF Elbow 90 Female Black 1"
MLB IRN GF Elbow 90 Female Black 1 1/4"
MLB IRN GF Elbow 90 Female Black 1 1/2"
MLB IRN GF Elbow 90 Female Black 2"
MLB IRN GF Elbow 90 Female Black 2 1/2"
MLB IRN GF Elbow 90 Female Black 3"
MLB IRN GF Elbow 90 Female Black 4"
MLB IRN GF Elbow 90 Female Black 5"